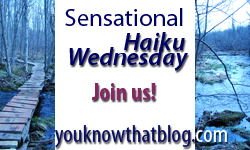 Silly Haiku Wednesday « You know… that Blog? Click here for info and background on this weekly event! Feel free to continue challenging your own visitors – we’re having far too much fun not to share! Wow, I’m first! The benefit of being a night owl. What a great haiku! Wouldn’t expect any less! Happy Haiku Wednesday! .-= Chanda @ Eco-Cheap Mom´s last blog ..Ecostore USA – A Review…and Giveaway! =-. my first time here, though I’ve tried my hand on haiku writing once or twice! better be it a crossroad! Very cute I am I think of the same mind as you Jenn just read and you’ll see what I mean. .-= Amanda Moore´s last blog ..New Blog of the Week BOTW =-. .-= Thom´s last blog ..Silly Haiku Wednesday – The Road =-. OK I did my eminent eight thing too today so you can have a nosey, I did it in a bit of a rush so hopefully I’ve written reasonably sensible answers! Great haiku, I was going to do something along the lines of the road of life but I ran out of time and inspirations! Todays will have to do, I’ll try and come up with something more inspired for next week! .-= Jade @ No Longer 25´s last blog ..Eight Eminent Eights =-. I really like this one. I pray that someday, I can avoid those wily speed bumps. .-= Polly´s last blog ..An Incredibly Random Post…Because I Have Nothing! =-. I like your haiku. I tried to think of something a bit deeper, but my head started hurting! I really enjoy yours! .-= Michelle´s last blog ..Haiku Wednesday: The Road =-. On the road I rap. For lines end with ‘Crap’. As I look across the road. Ah Knarf, you do make me giggle :) And thanks for giving these to me on paper last night – I may frame them! Now we’ll see if ShaMoo and John-Boy are up to the challenge. I think they might both be chicken. Hilarious! Thanks for the laughs! .-= Chanda @ Eco-Cheap Mom´s last blog ..Silly Haiku Wednesday – The Road =-. Hi, Jenn — Thanks for not giving up on me! I do love the haiku fest! .-= 21st Century Housewife´s last blog ..Poetry Slam! =-. 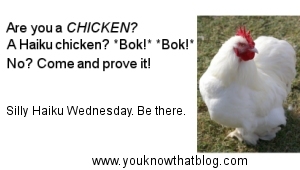 .-= tmc´s last blog ..Silly Haiku Wednesday: Games we play =-. Love it! I just read “The Road” my Cormac McCarthy. Now that was a rather depressing read! .-= Teri´s last blog ..focus on: getting better =-. Hey Teri – thanks for stopping by! Why not join us?? I would LOVE to leave you a message when I stop by your place (which I do, often) but you don’t have Name/URL enabled still! What’s a gal to do?! By the way, folks, ShaMoo sent me a haiku via email! So there’s only one hold-out from my group, and he’s being a stick-in-the-mud. I will get a haiku from him one day though, come hell or high water. This week was definitely an emotional haiku for me. And I hope time has a positive tale to tell for you. .-= Jessica´s last blog ..Nothing silly about this haiku… =-. .-= Lee the Hot Flash Queen´s last blog ..The Twelve Traditions =-. Love this theme, and yours is wonderfully thoughtful. .-= stephanie (bad mom)´s last blog ..bonding =-. You are all so smart. Words fail me; no good at this. One day, I will learn! He’s better than he thinks, isn’t he?! Ok, neither of them went with the theme, but I can’t complain. And of course, there are Knarf’s, above – he always does the theme. I LOVE my group. They love me. All is right with the world. Phew….glad we didn’t disappoint. Getting me to do a Haiku is one thing…asking me to add a theme on top?? Oye….too much stress!! Haha! You guys always come through for me – in spades. I’m never disappointed. …and it’s my sworn function in life to stress you all out. Mission accomplished!